Il est difficile de résumer brièvement l’essence de ce lieu si particulier en constante évolution. C’est une ferme pédagogique qui lors de notre passage cultivait entre 4500 et 5000 plants sur un peu plus d’un demi-hectare. 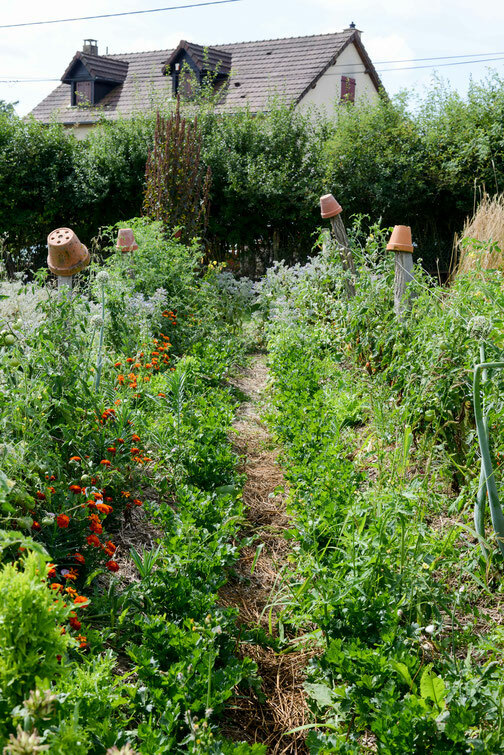 Cet éco-centre propose un superbe potager en mandala dans lequel pousse pêle-mêle des légumes, des fruits, des fleurs comestibles et des plantes médicinales ainsi que quelques buttes et serres de culture et un verger. Quelques animaux sont présents pour aider au jardin et participer à l’aspect pédagogique. C’est un jardin ouvert à ses adhérents pour la cueillette que l’on règle ensuite avec un tarif préférentiel, on peut y acheter quelques produits transformés sur place, on peut également y réaliser des stages de formation et les projets de développement de nouvelles activités autour de l’autonomie et de la nourriture saine sont nombreux. Aurore et Bruno en sont les fondateurs et les premiers habitants. Bruno est agriculteur et Aurore a exercé de nombreuses activités autour des jardins, de la permaculture et de l’animation pédagogique avant de se consacrer à la création d’Alosnys. C’est avec Aurore principalement mais également avec Bruno que nous réalisons une semaine de formation afin de découvrir les principes fondamentaux de la permaculture. It is quite difficult to briefly sum up the essence of this very particular place which is constantly evolving. It is a pedagogical farm which, when we came by, was cultivating about 4500-5000 young plants over a little more than half an hectare (about 1 ac). This eco-center offers an amazing vegetable garden in mandala shape in which grows in a beautiful mess vegetables, fruits, edible flowers and medicinal plants, it is completed by more cultivated mounds and green houses as well as an orchard. Several animals are there to help with the garden and the pedagogical activities. 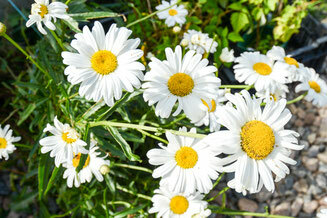 The garden is opened to all its members for picking which is then offered at a discounted price. It is also possible to purchase products transformed onsite, participate to a training session. There are numerous projects ongoing to develop new activities around autonomy and healthy food. Aurore and Bruno are the founders and first inhabitants of the location. Bruno is a farmer and Aurore has had various professional activities around gardens, permaculture and pedagogical animation before dedicating herself to the creation of Alosnys. 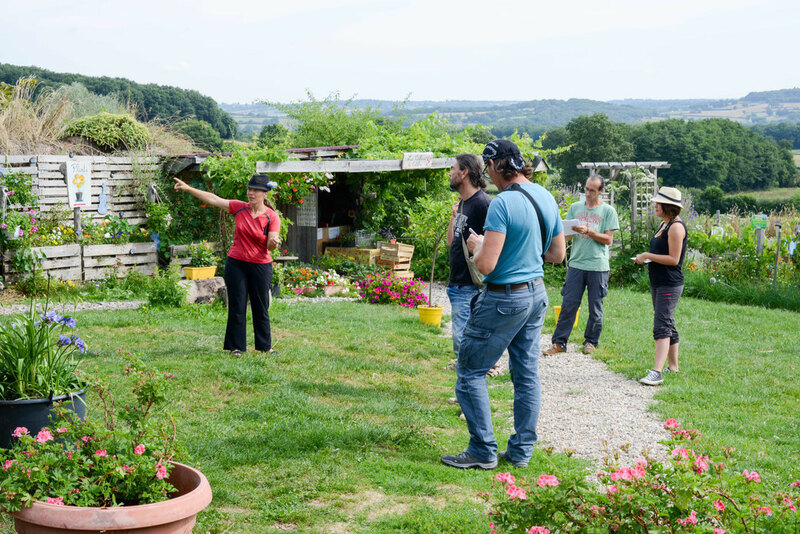 It is mainly with Aurore and also with Bruno that we did our one-week training session to discover the fundamentals of permaculture. The aim of the place is both productive and aesthetic, says Aurore. 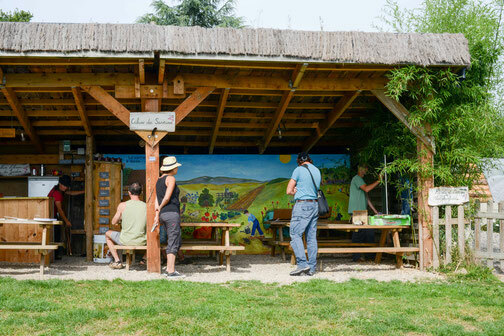 At the garden entrance, we happen on a shed, called the “flavor parlour”, with a green roof (planted with many plants) and equipped with a little refreshment stall and a huge wooden table. This is the area for the theoretical courses as well as to enjoy some garden syrups tasting. Derrière cette cave, nous trouvons plusieurs serres alors qu’en face de la cabane s’ouvre le potage en mandala. Derrière la cabane, se situe un petit pré pour les poules et les oies puis au-delà le corps de ferme. Commençons par les quelques serres situées en haut de ce terrain en pente douce. Il y a une cabane abritée dans laquelle de des établis assez haut permettent de travailler debout afin de réaliser des plaques de semis. Non loin, on trouve la serre à plants dans laquelle ces plaques sont déposés sur des établis similaires tout au long ainsi qu’au milieu afin de permettre une surveillance régulière, sur le chemin vers le potager, ainsi que l’arrosage. A côté on trouvera une ou deux serres dédiées à un mélange de plants de tomates, poivrons, piments, basilic et compagnons dans des lits surélevés et entourés de bois pour faciliter les déplacements au sein de la serre et la culture sans trop se pencher car il est possible de s’assoir sur le rebord des bacs ainsi formés. Going down towards the vegetable garden in mandala shape, we find on the way a big pile of compost ready to be used and on which some zucchini plants are running, enjoying the rich soil. The mandala is both a philosophical concept and energy vibrating shape. Concretely, it is a kind of labyrinth in concentric circles which center is here occupied by a pond. It is impressive to notice the well-being that overtakes us when we walk around the little alleys dug along the round elevated beds, high of about 60cm at their top. This mounds offer various expositions to the sun and the whole produces quite a breathtaking effect when seen from the sky (you can see some pictures on their website here). Moreover, it offers a great playing field for the children who love getting lost in this fertile maze. A lot of medicinal plants, aromatic plants and edible flowers can be found there as well as all kinds of vegetables of various heights. Those are arranged together is their most favorable companioning possible. The beds are regularly amended with compost and mulched with hay in order to preserve the quality and quantity of fertile soil. The alleys soil is also regularly brought up back on the mounds each year in order to limit the erosion. If the plants are trimmed or if branches and leaves have fallen naturally, those are left onsite in order to bring back to the soil the nutritive elements. The mulch layer is quite thick. After the mandala, we find other small cultivated areas with mounds of various kinds. Right before though, there is another pond, for the ducks. They are 16 when we visit it and they are kept inside their own space because the vegetable garden is fruiting but sometimes they are left to run around freely in it in order to devour the slugs. A green band of grass between the mandala and the other mounds and green houses at the lower part of the domain is kept by two Ouessant sheeps who are busy cutting the grass and limiting other grasses growth. Around the mandala, there are green alleys which are also under the responsibility of the two little sheeps. The other mounds are either elevated and circled by wooden planks to facilitate the access to children for example, or closer to the earth like regular beds. Green houses in this area are mainly dedicated to the tomatoes when we are there with their companion plants. Behind this space, there is a huge meadow of wild flowers and grass with beehives at the back. Going up on one side, we follow an alley, separated from the road by a thick edge of edible fruit bushes hosting numerous birds. 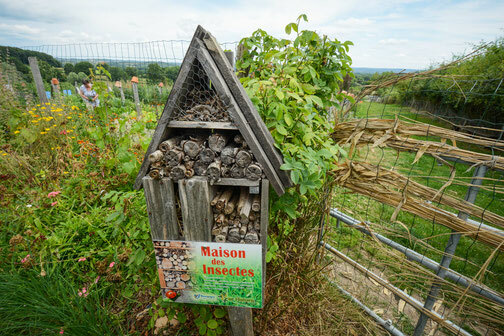 The entire domain is dotted with insect shelters, as simple as an upturned flower pot filled with hay or as complex and huge as a huge insect hotel in order to favour biodiversity and the presence of pollinizing species. Along the other side, when going up, we walk along a meadow protected by bushes and trees from the other fields. A walkway in the middle, between the vegetable garden and the green field facilitates passage and in the future will go right up the property to the new areas recently purchased. Going up, we finally reach the main farm building which is constituted on the right side by a barn where the woofers are hosted in tents or caravans and a workshop. In this workshop, everything required to tinker about can be found as well as another cold space for storage and huge cans for lacto fermentation. Behind the main house, there is a conservatory orchard in which are sometimes freed the gooses hosted on this side in order to amend and clean the earth. On the left side, well-closed in, a little field with two little playful goats which are making both adults and children smile. L’objectif du lieu, nous explique Aurore, est tout à la fois productif et esthétique. On découvre donc à l’entrée du jardin, une petite cabane des saveurs dont le toit est végétalisé et qui est équipée d’une petite buvette et d’une grande table en bois. Ce sera l’espace pour les cours théoriques ainsi que celui des dégustations de sirops du jardin. Devant cette cabane, un petit espace de pelouse fleurie mène au point de vente à la ferme, ouvert. Celui-ci a donc une caisse pour faire les comptes et également sous son toit de tôle, qui chauffe avec le soleil, des bacs dans lesquels sèchent diverses plantes. L’endroit bien aéré est idéal pour cette activité de conservation. Attenante à la cabane se trouve une cave, fermée d’une porte en bois, creusée dans la terre et végétalisée à l’extérieur d’une épaisse couche de plantes, fleurs et kiwi côté soleil et bambous au nord. Cette cave est bien plus froide que la température estivale et permet la conservation au froid, en sable ou non, des légumes qui sont adaptés à ce mode de conservation (potiron, patates, pommes par exemple). Behind the cellar, we find several green houses and in front of it, the mandala vegetable garden opens up. Behind the shed, there is a little grazing area for the chickens and gooses. Beyond there is the farm building itself. Starting with the green houses located at the top of the field which has a gentle slope. 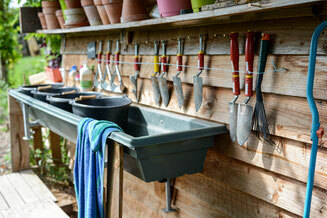 There is a sheltered shed in which workbenches, high enough to work standing, are used to make the seeding plates. 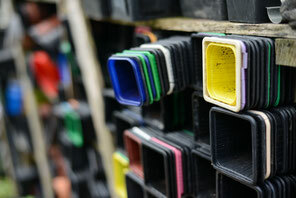 Nearby, there is the seedlings green house in which the plates are organized on similar workbenches all along its walls and in the middle in order to enable regular monitoring and watering on the way to the actual vegetable garden. 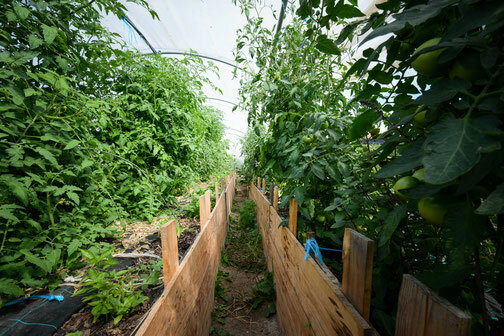 Next are on or two green houses dedicated to a mix of tomatoes, peppers, chili, basil and further companion plants in elevated beds which are circled by wooden planks to facilitated movement around them in the green houses and their care without having to bend too low as it is possible to sit on their edges. Descendons vers le potager en mandala, au passage on y trouve un gros tas de compost prêt à être utilisé sur lequel court quelques courgettes qui se plaisent dans ce riche terrain. Le mandala est tout à la fois un concept philosophique et une figure énergétique vibratoire. Concrètement, c’est une sorte de labyrinthe en cercles concentriques, dont le centre ici est occupé par une mare. Il est impressionnant de constater le bien-être qui nous envahie lorsque nous parcourons ses petites allées, creusées le long de ces buttes en rond, hautes de près de 60cm à leur sommet. Ces buttes offrent des expositions variées vis-à-vis de la lumière et l’ensemble produit une effet esthétique saisissant vu du ciel (à retrouver sur leur site ici). De plus, il offre un terrain de jeu incroyable pour des enfants qui adorent se perdre dans ce labyrinthe fertile. On y retrouve beaucoup de plantes médicinales, des aromates et des fleurs comestibles ainsi que des légumes en tout genre et de toute hauteur. Ceux-ci sont agencés par association favorable le plus possible. Les buttes sont régulièrement amendées de compost et paillées afin de préserver la qualité et quantité de terre fertile. La terre des allées est également remontées sur les buttes chaque année afin de limiter l’affaissement. Les tailles éventuelles ou les feuilles et branches tombées naturellement sont laissées sur place afin de redonner à la terre des éléments nutritifs. La couche de paille y est assez épaisse. Après ce mandala, on trouve d’autres petits espaces de culture avec des buttes en ligne de différentes sortes. Mais juste avant, on découvre une nouvelle mare, celle des canards. Ils sont 16 à notre passage. Quand nous y sommes ceux-ci sont confinés dans leur espace propre car le potager est en train de donner, mais ceux-ci sont parfois lâchés selon la période dans le potager afin d’en dévorer les limaces. Un espace entre le mandala et les autres buttes et serres en bas du terrain est entretenu avec deux moutons d’Ouessant qui s’affairent à tondre le gazon et limiter la prolifération d’autres herbes. Autour du mandala, il y a des allées enherbées qui sont donc sous la responsabilité de ces deux petits moutons. Les autres buttes sont soit surélevées et entourées de planches de bois afin de faciliter l’accès à des enfants par exemple, soit plus proches du sol comme des lits. Les serres d’en bas sont également principalement dédiées à la tomate lors de notre passage avec leurs plantes compagnes. Derrière cet espace il y a une grande prairie fleurie avec des ruches au fond. En remontant sur l’un des côtés on suit une allée, séparée de la route par une épaisse haie d’arbustes aux fruits comestibles et abritant nombre d’oiseaux. La propriété est semée d’abris à insectes, simples comme un pot de fleur en terre retourné et rempli de paille au grand hôtel à insectes afin de favoriser la biodiversité et la présence de pollinisateurs. En remontant de l’autre côté, on longe une prairie qui au fond est séparée d’une haie et d’arbres des autres terrains. Un chemin est dessiné au milieu, entre l’espace potager et la prairie pour favoriser le passage et dans le futur mener en haut de la propriété vers les nouveaux espaces acquis récemment. En remontant donc, on arrive au corps de ferme qui s’agrémente d’une grange où sont hébergés les woofeurs en tente ou en caravane et d’un atelier. 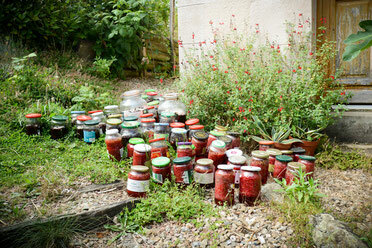 Dans cet atelier, on y retrouve tout ce qu’il faut pour bricoler et également, un autre espace de stockage frais et fermé et des bidons de lacto-fermentation. Derrière le corps de ferme, on trouve le verger conservatoire, dans lequel déambule parfois quelques oies hébergées de ce côté afin d’amender et nettoyer le sol. A gauche de verger, bien clôturé, un petit pré avec deux petites chèvres très joueuses qui font la joie des enfants et des adultes. 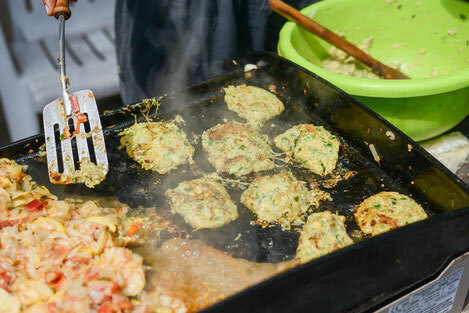 Il y a des projets en cours dans des bâtiments achetés de l’autre côté de la route afin de développer une cuisine pédagogique et des hébergements. Il y a également un projet de développement d’une serre en aquaponie avec bergerie et poulaille attenant. Dans son ensemble, le lieu est dessiné de façon réfléchie afin de favoriser l’autonomie en eau, énergie et nourriture tout en prenant en compte les contraintes du milieu et limiter un maximum les efforts inutiles. There are further projects in the buildings acquired recently which are located on the other side of the road in order to develop a pedagogical kitchen and some hosting space. There is also a development project for a green house in aquapony with an adjoining sheepfold and chicken coop. In general, the place is designed with a lot of thoughts into it to favour water, energy and food autonomy while taking into account the existing constraints and limit to the extent possible useless efforts. Concernant l’eau, il y a une source en haut du terrain qui permet d’avoir de l’eau et une relative autonomie. Il y a un projet de récupération d’eau de pluie ruisselant des toits et également un projet de mise en place de bassins de phyto-épuration. Concernant l’énergie, le raccord est fait au réseau. Toutefois, Alosnys a bien un objectif d’autonomie à terme. Il y une éolienne installée sur le toit mais la présence du toit perturbe les flots aériens et son orientation ne semble pas très adaptée, il y a donc le projet d’améliorer son placement et/ou son orientation. Regarding water, there is a source at the top of the field which enables a relative autonomy. There is also a project to collect rain water from the roofs and as well a project to set up a phyto-purification system. Regarding energy, it comes from the network. However, Alosnys does aim at becoming autonomous eventually. There is a wind turbine on the roof but the roof is actually disturbing the airflow and its orientation isn’t properly set, there is therefore a project to improve its location and/or its orientation. Il y a des toilettes sèches derrière le point de vente pour les visiteurs ainsi que dans la grange pour les woofeurs. Celles-ci sont à la sciure de bois. Il y a beaucoup de réutilisation et de récup sur la ferme et celle-ci étant autonome en légumes et partiellement en fruits, il n’y pas de déchets liés à cette partie de l’alimentation. Les autres déchets sont triés et remis au réseau de ramassage des poubelles. There are dry toilets behind the sale point for the visitors as well as in the barn for the woofers. These are sawdust based. There is a lot of reusing and recycling on the farm itself and being autonomous in vegetables and partially in fruits, there are no waste linked to this. Other waste is triaged and given over to the regular waste processing network. Aurore and Bernard are the owners and founders of the farm and Adrien had joined as a permanent resident to work on the farm as well when we passed through. Their objective is to develop a community with various competences in order to make of Alsonys a dynamic eco-center, filled with know-hows linked to the fundamental principles of permaculture: take care of the earth, take care of the humans and share fairly the resources. When we were there, there were two permanent people in winter completed by 5 to 6 vonlunteers in summertime. 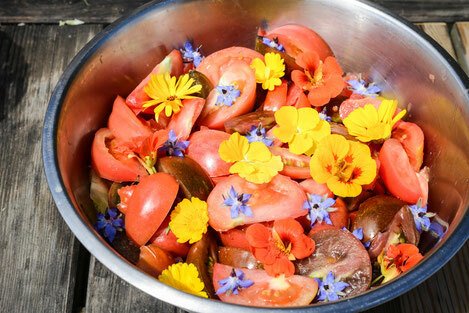 The daily meals are vegetarian to favor food autonomy, especially since the animals on the farm are there for pedagogical purposes with the children and not for providing food. However, the residents are not strictly vegetarians. 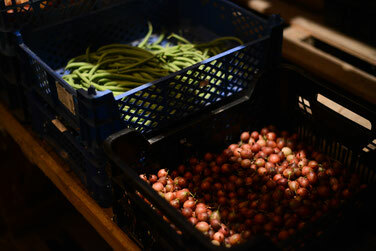 The vegetables are collected in the half hour preceeding the meals in order to preserve all their vital energy. The garden is opened daily from 10 am till 6pm for collects and visits, either freely or guided. The visits are payable for those who are not members of the association. Plants are also sold during the season. Alosnys organizes regularly trainings, workshops and festivities, offers extra-curricular activities for children in the garden and also participates to conferences and various festivals outside within the region. The renovation of the buildings that will be used for the pedagogical kitchen and the hosting is done thanks to a partnership with a building school. Aurore explains the importance of networking with the locals and within various networks to survive and thrive and create solidarity and mutual aid relationships. She warns us not to mistake autonomy with autarky. La ferme est tenue par Aurore et Bernard ainsi que Adrien lors de notre passage. Leur objectif à terme étant de développer une communauté aux multiples compétences afin de faire d’Alosnys un éco-centre dynamique, plein de savoir-faire liés aux principes fondamentaux de la permaculture : prendre soin de la terre, prendre soin des hommes et distribuer équitablement les ressources. Lors de notre passage ; il y a donc un a deux permanents en hiver complété en été de 5 à 6 volontaires. Les repas au quotidien sont végétariens pour privilégier l’autonomie alimentaire, notamment car les animaux présents sur le site sont dédiés à la pédagogie avec les enfants et non à fournir de la nourriture. Toutefois, ils ne sont pas végétariens strictes. Les légumes sont cueillis dans la demi-heure précédent leur consommation afin d’en préserver toute l’énergie vitale. Le jardin est ouvert quotidiennement de 10h à 18h à la cueillette et à la visite soit libre ou guidée moyennant un ticket d’entrée pour ceux qui ne sont pas adhérents à l’association. Des plants sont vendus également lorsque c’est la saison. Alosnys organise régulièrement des formations, des ateliers et des fêtes, proposent des activités périscolaires pour les enfants dans le jardin et participe également à des conférences et festivals à l’extérieur dans la région. La rénovation des bâtiments qui seront dédiés à la cuisine pédagogique et l’hébergement se fait en partenariat avec une école de construction. Aurore nous explique l’importance de s’insérer dans le tissu local et dans les réseaux divers et variés afin de survivre et créer des liens de solidarité et d’entraide avec son environnement. Elle nous met tous en garde de ne pas confondre « autonomie » avec « autarcie ». La liste est loin d’être exhaustive et ne donne pas une idée de la générosité du jardin en quantité et qualité puisqu’on y trouve entre 4500 et 5000 plants au moins sans compter les vivaces et les semis directs et la productivité de chacun de ces plants. La tomate est la plus demandée. Les variétés anciennes sont très appréciées. 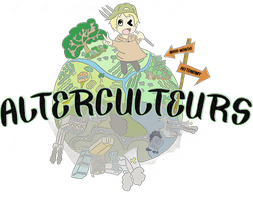 Toutefois, sa culture, très demandeuse et contraignante, devrait presqu’être retirée dans un endroit en permaculture qui cherche à diminuer les efforts inutiles. Les ruches produisent également 120 kg de miel. Il y a un projet de faire venir 6 chèvres pour faire du lait et du fromage. The list is far from being exhaustive and does not give a truthful account of the generosity of the garden neither in quantity nor in quality since we can find there more than 4500 to 5000 plants without counting the numerous perennials and direct sowing and the productivity of each of the plants. The tomato is the all-time favorite. The ancient varieties are very appreciated. However, its very constraining and demanding culture could nearly be excluded of a permaculture place which looks to reduce the required efforts. The beehives produce about 120 kg of honey. 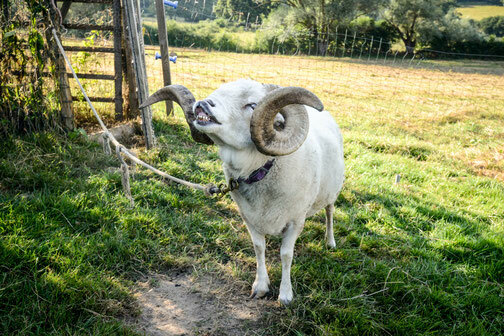 There is also a project to add about 6 goats in order to produce milk and cheese.